Mylo is 10 weeks old short-legged Jack Russell. She has a pure white body with a patch of tan on her right eye and on her left ear. She is very playful and loves digging up the garden. I couldn't ask for a better pet. That is my dogs twin!!! i have a 9 wk old all white with a tan patch over his right eye too!!! Did u see the purina commercial yet??? This is my first puppy & I'm tellin' u... he's a handful but I wouldn't trade him for the world! Your little girl looks like an absolute sweetheart! I just love her little brown patch over her eye! 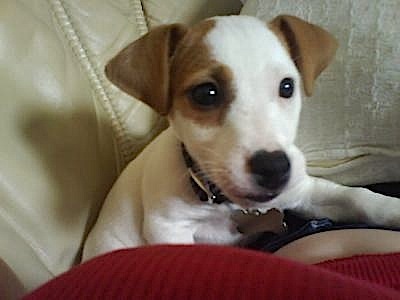 She's so cute, I wish my Jack Russell was that small again.